Small businesses in Maine come in many shapes and sizes but most have energy saving opportunities. Many could benefit from upgrading to high-efficiency lights or updating their heating and cooling system. Read below for more information on saving energy at your small business. Efficiency Maine offers a special program to encourage lighting upgrades in eligible small businesses in specific geographic regions. To find out if your business is in one of the current regions, click here. Small businesses can reduce energy costs by upgrading to energy efficient heating and cooling systems, or by adding controls to existing systems. Ductless Heat Pumps. Ductless heat pumps offer room-by-room control of heating and cooling. Many Maine businesses are choosing ductless heat pumps as an efficient and quiet way to meet heating and cooling needs. Small businesses may reduce water heating costs by upgrading to high-efficiency water heating systems and choosing a system that meets the needs of specific spaces. Restaurants may benefit from upgrading cooking and commercial refrigeration equipment. Click here to review Efficiency Maine’s guidance for restaurants. Auto repair and other businesses may consider upgrading compressed air equipment. Click here to learn more about compressed air incentives. 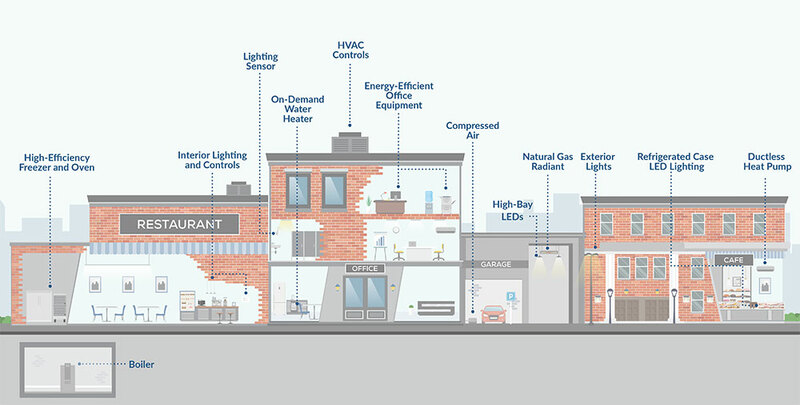 EnergyStar.gov has energy management guidance for small businesses. Click here to learn more. If you're a “Small General Service” (SGS) electric customer and in an eligible town, Efficiency Maine has a special Initiative to upgrade your lighting to LEDs. To Find out more click here.